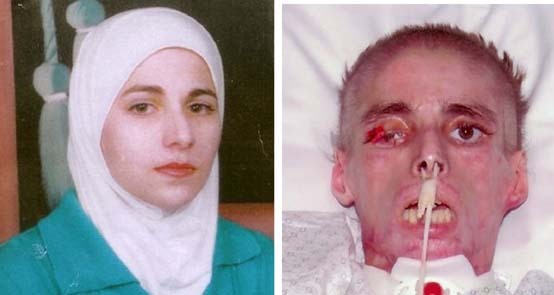 The Greater Cleveland Immigrant Support Network��learned about this Palestinian-Cleveland-area Muslim woman who had been burned in a domestic abuse setting in her home. This happened Dec 24, 2003. Other vounteers and I have visited with Mai two-three times a week for the past three months, taking her mother to the store, going to art therepy with Mai, just sitting with Mai, exchanging a few words casually or for comfort and even some laughter; and doing whatever is needed. Mai Al-Hamed is 26, green card status (pending). Her mother Fatima, is on extended visitor visa, from Jordon. They both speak Arabic, and some English. Husband, far less severely burned, died of heart failure on the operating table at Metro General Hospital. Mai, has 2nd and 3rd degree burns on the front of her body, lost the ability to walk, lost both hands, except one finger and, lost vision in one eye, among other complications. Mai now walks with leg braces, is able to feed herself and paint beautiful pictures with the use of the "universal cuff", the hair on her head has grown back, her skin slowly healing, however scarred and prone to infection. Her Kaiser insurance has covered the hospital surgeries and care. Fatima, (mom) has stayed in Metro Hospital's Hospitality apartments. Now this will end, Mai must be released from the hospital. A group of various agency reps, ( Metro General social worker, AACCESS-Arab/American community group, Domestic Violence Network and others) supporters and Mai and Fatima met Thursday (11-4) to help devise a future care plan and living arrangements for Mai and Fatima. Metro Hosp. suggested their state-funded nursing home. Fatima and Mai would prefer to be in a small apartment or house (ground floor, preferable, but not limited to that). Donations of cash have been coming in from sectors of the Arab/Muslim network in Cleveland and Warren, Ohio. Kaiser will pay for in-home care, limited to daily changing of the dressing on her wounds, daily. Mom and Mai understand this and feel that Mom can be the best caregiver, especially with her home cooking, which has sustained Mai ever since she was able to eat whole food again.